I was born and spent the first four years of my childhood in Ireland before emigrating to the United States with my family just over fifty-two years ago. Unfortunately, I have very few memories of those early years of my life and if truth be told, feel more American than Irish. However, there are a few things that I have carried with me. In a symbolic and emotional way, I cherish all things Celtic and love the feel of the Irish ground below my feet when I visit – almost as if my soul recognizes home even when my head has a different story. And, in a literal and concrete way, I have carried with me a tiny Irish egg cup that was made there many years ago. Soft boiled eggs were a common breakfast for us in Ireland and at some point, egg cups were made for me and my four siblings – simple, yet beautiful, little blue cups with our names etched into them in. They became icons of our youth and were always on display in our childhood home long after they stopped being used. Ironically enough, I was allergic to eggs as a young child and never actually used my cup for the purpose it was meant for. I do know that it has held coins, and stones, and many other small items that found their way into its empty space over the years. And, along with it literally holding objects, it has held my heart in a way that I’ve never been totally clear about. Perhaps it’s the connection to my early childhood and my Irish roots that my heart remembers, even though my mind has long ago forgotten. At some point along the way, this little blue vessel fell and broke into many pieces. 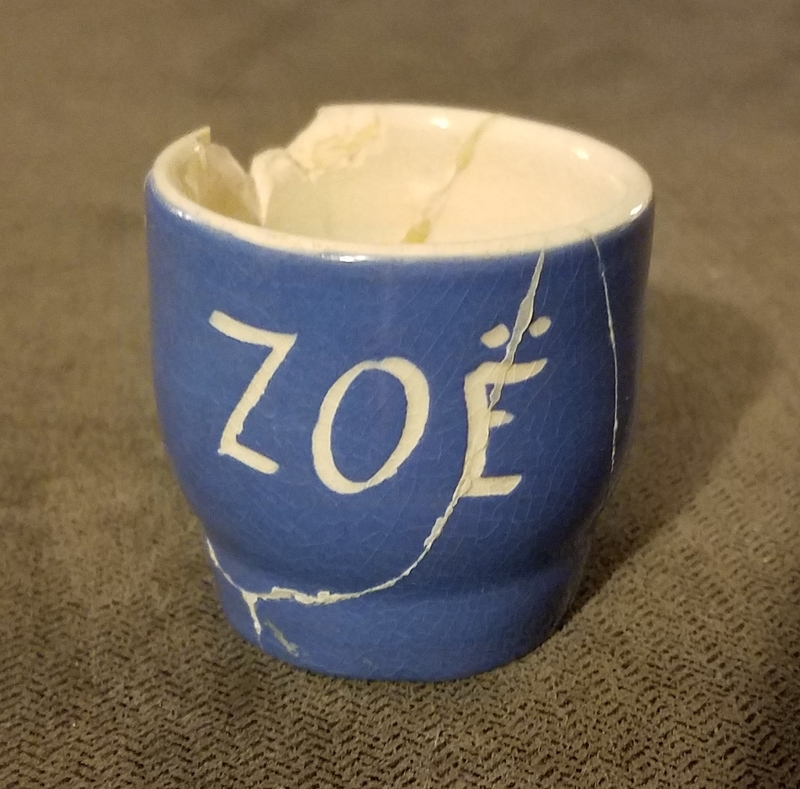 My mom must have painstakingly glued back together whatever fragments she could, because today my egg cup sits in an honored space in my grown-up home. Sadly, for many years, I held on to it as a symbol of my own brokenness and in some way believed that mine was the only shattered one because I was the only shattered one. I would view it with a sense of sorrow, over how broken it looked and how broken I felt. This belief slowly faded away as I began to painstakingly glue back together the fragments of my own soul, just as my mom had put back together my broken egg cup. Over more recent years, I’ve looked at this little blue cup with more of a sense of pride – although I’d felt broken, I was putting myself together, and I felt strong. I’m sharing about my Irish egg cup because over the past year, I’ve again felt shattered – this time with grief. A grief that brought on deep uncertainty about what life was all about. A grief that had me lose my sense of balance and left me feeling disoriented and lost. And I’ve struggled at times to believe that anything other than heartache and pain would exist in the days to come. In many moments over these past 12 months, I have felt completely un-whole. And then, recently, some wisdom showed up in the form of an image of my egg cup. It came floating across my awareness and, with it, two words that repeated themselves over and over again in my mind’s ear – Broken and Whole. These are not two states of being that are solely exclusive of one another; they are pieces of me, of my egg cup, of all of us, that coexist and dance together in this rhythm we call life. I wept at the simple beauty of this poignant realization. I can be broken . . . and I am whole. And I am grateful for the lesson that my little blue Irish egg cup has carried with it across the ocean and into my heart. Thank you for the tender message. I totally understand love you.